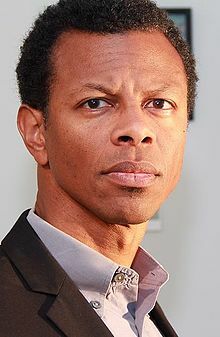 Phillip "Phil" LaMarr (born January 24, 1967) is an American actor, voice actor, comedian and impressionist. He was best known as one of the original cast members on the sketch comedy series MADtv, and is known for his voice roles in various animated series such as Justice League, Justice League Unlimited, Futurama, Samurai Jack, Static Shock, and Foster's Home for Imaginary Friends. 2015 Cook-Off! Rev. Thaddeus Briggs, Esq. Episode: "Crazy Mixed Up Puffs/Mizzen in Action"
2004 Maya & Miguel Mr. Shue Episode: "The Taming of Mr. Shue"
Episode: "Fairy Friends and Neighbors/Just the Two of Us"
Episode: "Love 'Em or Leash 'Em/Teen Team Time"
Episode: "Bringing Down the Mouse/To the Moon"
Episode: "I Hate the Eighties"
Episode: "Go with the Flow"
2007 Curb Your Enthusiasm Pharmacist Episode: "What Did Nick Do?" 2009 The Super Hero Squad Show Captain Jamaica Episode: "O, Captain, My Captain!" 2012 Scooby-Doo! Mystery Incorporated Melvin Keisterbaum Episode: "Web of the Dreamweaver!" Episode: "From Hedorium to Eternity"
Brian Chard [bcharred] (April 14, 2015). "...Nathan Hosner (Narrator); Kelly Hu (D'Vorah/Sindel/Frost); Phil LaMarr (Kotal Kahn); Will Yun Lee (Kung Lao); Patrick Seitz (Scorpion)..." (Tweet). Retrieved April 21, 2015.